Piet Keizer may have been just as important to the Golden Ajax of the Seventies as Johan Cruyff or Rinus Michels. At the time of the Wembley final some considered Cruyff as only a finisher of the many assists of Keizer. They felt Keizer was the majestic heart of the Ajax-game with his artistic moves and tricks. Others noticed who he could dream away parts of a match to come to live with a sudden flash of brilliance. He was a bit special, in and outside the pitch. He did not speak to Rinus Michels for two years and danced on the table in the Oester Bar, owned by his father-in-law, when the news filtered through that his incredibly succesfull coach had signed for Barcelona in 1971. Keizer just was not like any other footballer, which would ultimately be emphasized by his radical decision to quit. Fourteen years earlier Piet Keizer made his professional debut for Ajax in a home game against Feijenoord as an inside left in a forward line of five. At that time Dutch football had only just introduced professionalism and played a marginal role in Europe. A few months before, in October 1960, Ajax had stumbled over Norway’s Frederikstadt FK in the first round of the European Cup after only their third title since the War. In 1964 Ajax even had to leave the title to promoted neighbours DWS from Amsterdam-West. That season a severe injury almost cut Keizer’s career short. In a cupgame, a collision between the heads of Piet Keizer and André Pijlman broke the scull of the unlucky ‘ Ajacied’, who needed an operation to survive as some blood clothered in his brain. At first it looked like he would never play again, but after a long recovery Keizer returned to the pitch better than ever. And he had to be as in 1964-65 Ajax suffered their worst season in professional football under trainer Vic Buckingham, who had to resign after the winterbreak. He did however introduced the young Johan Cruyff into the team. When the club appointed Rinus Michels, his task was to keep them in the Eredivisie. Any thoughts of playing in the European Cup, never mind winning it, where far, far away. Yet in their first complete season together Cruyff and Keizer showed they could form a great pair. The two along with Sjaak Swart and Klaas Nuninga in the forward line scored a champion winning 54 goals between them. During the next season they broke all Dutch goalscoring records to win another title, but their biggest triumph was in Europe where they eliminated Bill Shankley’s Liverpool convincingly. By then, Piet Keizer was an established international who ran rings around every defence in Holland. The games against Liverpool in the second round of the European Cup should be a challenge, but he had a better idea. The progress in his talks with the Ajax board about his new contract did not go so smoothly. Keizer could not fence with interest from abroad, as there was not any in those days and nationally no other club could afford the transfer fee on his forehead. For a long time Ajax directors were of the opinion that playing for the club was an honour, while there were no agents to help out. With the tie against Liverpool coming up, he had a cunning plan that had picked up from his collegues. He did not play. Claiming an ankle injury he attempted to show the board how the team needed him. The whole plot exploded in his face, when the thick fog gave the game its own momentum and Keizer’s replacement Cees de Wolf scored twice in a 5-1 victory over the Reds. Afterwards the remorseful patient came running down the player’s tunnel to kiss De Wolf on his cheek with his performance. Keizer had felt uneasy in letting his teammates down and was relieved it did not go wrong. In the return at Anfield he had a great game, but his position at the negotiating table was obviously worse. In the meantime, Keizer had made his debut in the Dutch team in 1962 with a rout over the Dutch Antilles (8-0) in which he also scored his first goal. His next victory with the team would only be four years later. The head injury kept him out for some time obviously, but in the sixties the club would also go before country. National coaches like the Rumanian Elek Schwartz, Dennis Neville and George Kessler were most of the time stuck between a rock and a hard place. The Dutch FA treated the capped players like amateurs, which made their enthousiasm to play in an orange shirt decrease rapidly. It was also easy for clubs to refuse an invitation as Rinus Michels did for youngsters like Johan Cruyff and Piet Keizer when he felt an international game did not fit in the club’s schedule. Doctor John Roling became famous for diagnosing Ajax’ players unfit. With this attitude the Dutch never even came close to qualifying for any tournament in the sixties. Even Luxemburg proved a stumbling block in the knock-out stage of the European Championships in 1963, a game in which Piet Keizer did feature, but disappointed. Debutant Piet Giesen of PSV on the right wing was much livelier, at least in the first half. In the second he was just kept out of the game by his collegues as they felt their mate Sjaak Swart should not lose his place to this young intruder from the South. In 1966 the tide seemed to turn with the appointment of coach George Kessler. Against a Scotland without Celtic-players at Hampden Park Holland scored three without reply. After the summer the Ajax forward line of Sjaak Swart, debutant Cruyff and Piet Keizer started for the first time in the national team. They opened the qualifiers for Euro 68 with a 2-0 score on the hour against the mighty Hungarians, who eventually managed to come away with a draw. Any hope of succes was shortlived. In his second game Cruyff became the first Dutch international to be send off, gesturing so much that he inadvertently hit referee Rudi Glöckner in his face . In all its wisdom the Dutch FA decided to suspend their best young talent for a year. When Cruyff returned, any chances to go to Euro 68 were gone. In the meantime Piet Keizer had taken the left wing position in the team over from Feyenoord legend Coen Moulijn. This caused a new controversy as this did not fall well in and around Rotterdam. To appeace all sides coach George Kessler used a friendly against Yugoslavia to play Keizer ánd Moulijn alongside Swart and Cruyff in a 4-2-4 system. The experiment lasted only 18 minutes when Keizer retaliated and became the second (Ajax-) player to be send off. Again the Dutch FA ruled: a five game suspention for Keizer. Not in the national team, but for leaguegames of Ajax. It caused an outrage in Amsterdam, where the internationals refused to play the next game against the Soviet-Union in Rotterdam. Cruyff, Swart and Benny Muller would soon return in the squad, but Piet Keizer refused on principal grounds. He stated never to wear the orange shirt again until no one would be suspended for his club for something he did for his country Keizer had to wait for this change of rule until the summer of 1970 during which another big tournament went by without the Dutch. By then Piet Keizer was perceived as ‘difficult’ in the football and media world. He did not see the added value of interviews for the sports pages or magazines. Why should he waist his time to speak to someone who would contrive their own story from his words? Why should a magazine make a profit with him on the cover when his contribution remained unpaid? Keizer just had no interest in popularity. He raised his prize for commercials to such absurd heights that advertising firms would shy away and he would not be bothered. In the early seventies Keizer became so hot that even that would not help. He endorsed tea, football shoes and club-pyama’s in an ad with Ajax and Feyenoordplayers. Off the record Keizer could be friendly, while had a sharp wit. Rather then performing in a talkshow or any other tv-programme Keizer would talk at length with any other angling affeccionado. “Scoring a goal in front of 65.000 people is one thing, but do you know what it means to me when I have hooked a pike-perch?”, he said in one of his rare interviews. In fact, it was not even an interview. It was an essay about him by his friend and writer Maarten de Vos in his book ‘De Ajacieden’, who used his conversations with Keizer for his article. In another book ‘De Trots van de Wereld’ writer Menno de Galan got hold of the notes of two psychologists, working with the Ajax-squad in the sixties. While most players were reluctant, shy or had the ‘I am not mad’-attitude in their sessions with the shrinks, Keizer played games with them and managed to get one fired. The experiment backfired on the board. They had appointed both doctors in the hope to find a solution for the strained relationship between Keizer and coach Rinus Michels. Keizer outwitted them. Keizer was very much a team player, who had severe problems with his trainer’s attitude in the group. Michels once said that he saw his players mainly as numbers, who were given a task to fulfill. He was so result-driven that any mistake could be the last for a anyone in an Ajax-shirt. Several friends of Keizer over the years were coldly dismissed on the way to the European Cup finals. As a lover of the artistry in the game the left-winger felt Michels was killing the game. Michels was unable to handle the subversive Keizer, but had to admit he was irreplaceable in the team. Their feud peeked after the Fairs Cup seimi-final at Highbury in 1970 when Ajax lost 3-0 to Arsenal. Michels openly ridiculed Keizer’s bad defending to which the player reacted sarcasticly. From then on both chose to remain silent against each other. When Michels left Ajax for Barcelona after winning their first European Cup final it was said that Keizer ‘danced on the table of the Oesterbar’, when he heard the news. The new coach Stefan Kovacs gave the squad a free reign which resulted in a majestic 1971-72 season with a clean sweep of all available trophees. In his second year the jig was up, due to the deteriorating discipline and the diminshing team spirit, although the team did manage to win another European final in a graceless match against Juventus. 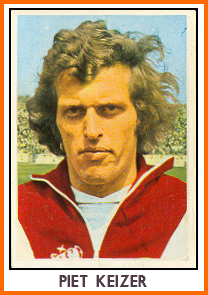 After Johan Cruyff joined Rinus Michels in Barcelona in the autumn of 1973 Ajax fell in decay, taking Piet Keizer along. While the team slipped to third in the table, Keizer lost his place in the national team first to Willy Brokamp of MVV and later to Rob Rensenbrink, who played for Anderlecht. When Rinus Michels was added to the Dutch staff as a supervisor, as the job was called, the chances for Keizer on the World Cup in Germany seemed to wain. Yet he did receive an invitation. In the Hiltrup training camp Michels tried to make good and their relationship lost its nasty edge. Unfortunately for him, Keizer just was not good enough anymore retain his position. He only played in the goalless groupgame against Sweden and was overlooked at half-time in the final when Rensenbrink was injured. René van der Kerkhoff became the surprise substitute of which Keizer afterwards agreed that it was the best choice Michels could have made. After the return at Schiphol Airport he left by a backdoor and was AWOL during the celebrations at the Queen’s palace. Before the end of the year Keizer’s active career was over. At the start of the new season the new Ajax coach Hans Kraay put him in midfield as Keizer had lost the pace for a position on the wing. Keizer could not settle in his new role and was substituted several times at the break. In a rare appearence on a talkshow of Mies Bouwman, the first lady in Dutch television, Piet Keizer suddenly announced his immediate retirement for a shocked audience. Although he kept being involved in football as an advisor, agent, scout and for a short while as a technical director at Ajax, his playing abstinence has become legendary. Once, it is told, he was watching a youth game when the ball came rolling right towards him. Instead of returning it, Keizer stepped away.